Figure 1. Some of the apparatus with which Antoine Lavoisier laid the foundations of modern chemistry. Figure 2. In the 18th century, books of popular science were widely read in England and in Western Europe by both men and women. Figure 3. John Fitch's steamboat. Figure 4. 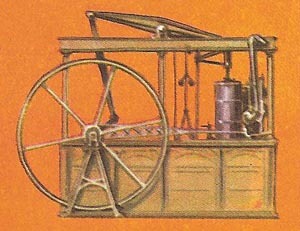 Joseph Cugnot's steam carriage. Figure 5. One of the engines built by James Watt. 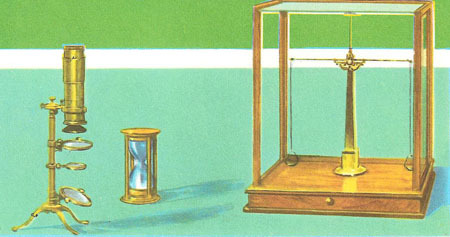 In Figure 1, you can see some of the instruments used in his researches by the great French chemist Antoine Lavoisier: a microscope, an hour-glass, and a balance. With them he laid the foundations of modern chemistry. Of the three, the balance was the scientist's most constant aid; it was owing to his habit of always weighing with great care the substances he used in his experiments that Lavoisier achieved results of such lasting importance. Clearly, the balance used by Lavoisier was simple, but it was also extremely sensitive and accurate. The central pillar is tall, but strong and stable, and the arms branching out from it are light and delicate. A long needle rises up from the balance arms and moves across a scale some distance away, so that very small movements of the balance arms are magnified and made easily visible. It was possible with a balance of this kind to measure weights to within a tenth of a milligram. Lavoisier was the first chemist to use this simple but all-important instrument properly. The necessity for the careful weighing of substances at all stages of an experiment had been neglected by earlier scientists, and the result was, as we shall see, that certain incorrect ideas were widely believed. It was not until these had been corrected that further progress in chemistry became possible. By the eighteenth century the alchemists (see alchemy) who had once tried in vain to find the philosopher's stone and the elixir of life were only a memory; the search for knowledge was now conducted along genuinely scientific lines. Many new elements (such as nickel, platinum, manganese, nitrogen, and chlorine) and a few compounds (such as carbon dioxide and hydrochloric acid) had been identified. In England science was so far advanced that plans had been made for the industrial production of sulfuric acid. Despite this increasing knowledge, scientists were still hampered in their researches by an unfortunate theory which today seems to be a last relic of the age of the alchemists. It was thought that all combustible materials contained a mysterious substance called phlogiston, the principle of fire. When materials burned, it was the phlogiston that was seen to escape in the form of flames. Even when it was shown that the products of combustion weighed more than the original material, this was accounted for by the belief that the phlogiston that had escaped must have a negative weight – that is, it weighed less than nothing. In a series of experiments on the combustion of mercury, Lavoisier showed that in fact when mercury "burned" it combined with a part of the air – oxygen – and increased in weight. By the use of the balance he showed that the weight of the oxide formed was equal to the weight of the mercury and the oxygen that had combined with it. His experiments finally disproved the phlogiston theory, and the way now lay open to the proper understanding of other chemical reactions. 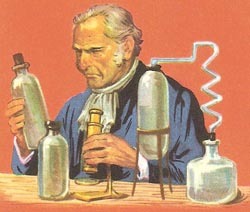 In later experiments Lavoisier discovered the nature of air and water. He has justly been called the father of modern chemistry. 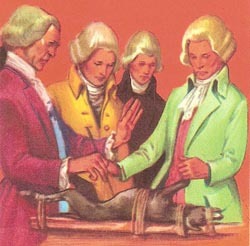 The second quarter of the eighteenth century saw a great outpouring of literature aimed educating the European elite in the latest scientific breakthroughs (see Figure 2). Science had suddenly become fashionable. 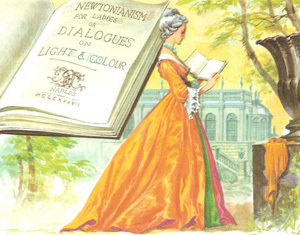 In 1737 one of the best-selling books was Newtonianism for Ladies: Dialogues on Light and Color, published in Naples. 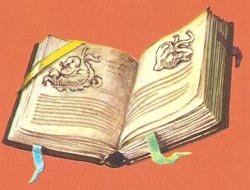 Another popular work was the Encyclopedia of Sciences, Arts, and Trades, published in France. At the same time, scientific societies, such as The Royal Society, founded in the reign of Charles II, grew. At the beginning of the eighteenth century two of the greatest mathematicians of all time: the Englishman Sir Isaac Newton and the German Gottfried Leibniz. They were followed by a great number of disciples such as the Swiss Leonard Euler and Jakob and Johann Bernoulli of Basle. But the greatest mathematician of the eighteenth century was Joseph Louis de Lagrange who was born in Turin and lived and died in Paris. The great achievement of these remarkable men was that they developed and perfected a new branch of mathematics – differential and integral calculus – which was the instrument which made possible the development of physical science. The first science that benefited by the work of the mathematicians was physics. However, the great contribution to science of this century was not so much the actual discoveries that were made as the attitude of mind which the scientists brought to their work. They no longer tried to discover and explain natural laws by argument and reasoning; instead they set themselves to studying nature itself, to investigating phenomena, classifying them, and trying to reproduce them by experiment in their laboratories; they thus developed what we call the scientific method. Studies were made of the laws of mechanics, so continuing the work of Galileo, who had died in 1642; of dynamics, and optics, carrying on the investigations into the origin of color which were started by Newton. In 1742 the Swede Anders Celsius set up the centigrade degree as the unit for measuring heat, and in 1791 the French Academy of sciences proposed a new unit of length, the meter; this was the birth of the decimal metric system. In 1735 a prize was awarded to John Harrison by the British government for the design and making of a chronometer for the precision determination of longitude. It was in the eighteenth century that electrical phenomena were first systematically observed and studied. Public interest in the strange phenomena of electricism, as it was then called, was enormous. Throughout the century the hobby or pastime of anyone who wanted to show that he was up-to-date with the marvels of progress was to experiment with electricity; this even became a parlor game. Before the royal court, at Versailles, the Abbé Nollet, who was very interested in experiments of this kind, gave a successful demonstration of the transmission of an electric current or shock through a circle, about one mile long, of Carthusian monks connected to each other by iron wire; this was done to show the royal court the speed of transmission of electricity. But other results were obtained which, although using less novel and spectacular apparatus were to be of great importance to mankind; in 1752 Benjamin Franklin discovered the lightning conductor; in 1791 Galvani published a treatise on his work on electricity and the animal body, and at this time Volta was engaged on the studies which led him to the construction of the voltaic battery, forerunner of the dry battery of today. 1735 – The Swedish botanist Carl von Linné, called Linnaeus, published his great work The System of Nature, in which he set out his system for the classification of animals and plants. His system is still the basis of classifications used today. 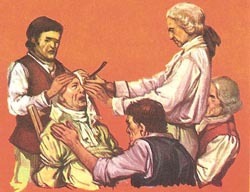 1735 – The French oculist Jacques Daviel (1693–1762) developed a method for the removal of cataracts from the eye. 1761 – The Italian doctor and anatomist Morgagni published his great work on the nature and causes of disease, showing the differences between healthy and diseased organs. 1762 – The first veterinary college was set up at Lyons, in France, by King Louis XV. 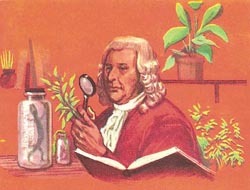 1767 – Lazzaro Spallanzani, an Italian naturalist, provided evidence against the "spontaneous generation" of living organisms by his experiments on fermentation. 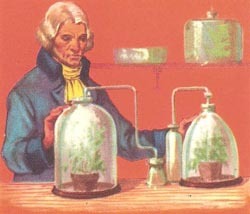 1779 – The Dutch physician and chemist Jan Ingen-Housz (1730–99) published the results of his work on plants, which showed that they had the power to purify the air by removing carbon dioxide from it. 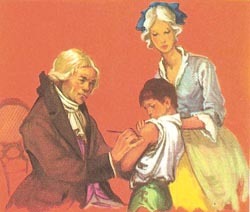 1796 – The English doctor Edward Jenner successfully made the first small-pox vaccination. His work was perhaps the greatest achievement of 18th-century medicine. Together with pure science, technology made giant strides in the eighteenth century. We are apt to say that the period of the outstanding inventions was in the 1800s: the locomotive (Stephenson, 1829), the steamboat (Fulton, 1807), photography (Daguerre, 1839), the telegraph (Morse, 1837), the internal combustion engine (Lenoir, 1860), the dirigible (that is, a steerable balloon, now called an airship) – all of these were inventions of the nineteenth century. It would be more accurate, in fact, to say that these were not so much inventions as developments and improvements, since each of them was the result of experimental investigations made in the previous century. 1707 – Denis Papin, who had constructed a steam engine some decades earlier, now built a paddle-boat which he tried on the Fulda River, but the paddles were turned by man-power. In 1775 Jacques Perier for the first time moved a small boat by steam power on the Seine, and by 1790 John Fitch (see Figure 3), an American, was operating a commercial steamboat carrying 30 passengers. 1727 – J. H. Schultze observed that silver nitrate, when exposed to the air, turned black due to the action of light. Thomas Wedgewood, in 1802, obtained the first photographic images, using this salt. 1753 – An anonymous correspondent published in the Scots Magazine a report on the possibility of transmitting signals by means of an electric current. The writer considered that it would be necessary to use one wire for each letter of the alphabet. An apparatus based on this idea was constructed in about 1774 by the Swiss Georges Louis Lesage. 1769 – Nicolas-Joseph Cugnot, of Lorraine, built a three-wheeled wagon propelled by a steam engine (see Figure 4). This vehicle was so crude and so difficult to steer that it steam to be of no practical use. In the last of the century Richard Trevithick, a Cornishman, designed and built a much more manageable and useful steam-propelled carriage, and so he is often spoken of as having made the first locomotive. 1783 – Almost simultaneously, in France and England, the first ascents with hydrogen-filled balloons were made. The first free ascent (unattached to the ground) in France was made by the physicist Jacque Charles; the first ascent in England was by the Italian Vincent Lunardi. 1781–85 – James Watt (1736–1819), working in Scotland, made very important improvements in the steam engine; he made use of the expansive property of steam, thereby increasing the efficiency of the engine (see Figure 5). Used in industry, the steam engine became the principal factor in the Industrial Revolution of the next century.